Our visit takes us predominantly to Rwanda but we have made many friends in the Democratic Republic of Congo. 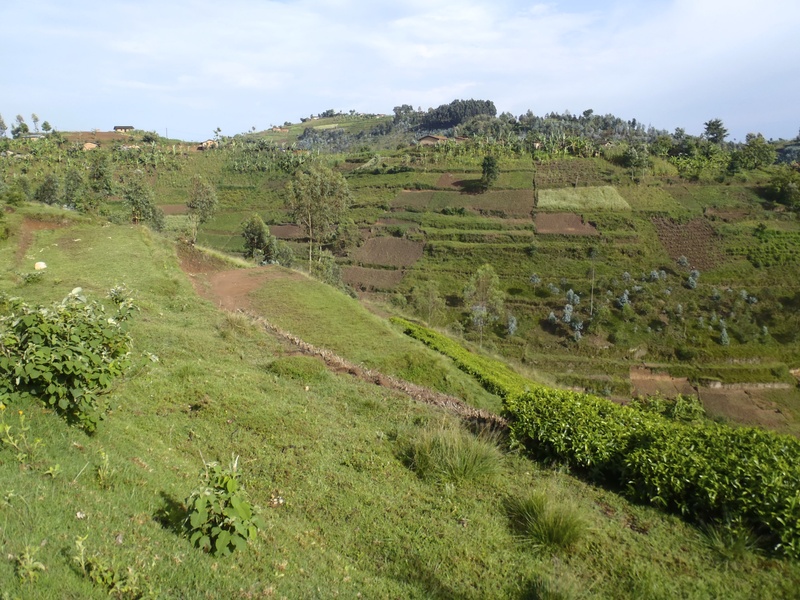 Rwanda – land of a thousand hills….. Situated in central East Africa, Rwanda is a landlocked country, no bigger that Wales . It has been rightly called ‘The Land of 1000 Hills’ because there is very little level land anywhere. Unlike its neighbour the Democratic Republic of Congo (DRC) it has no mineral resources of any kind. People live by the land and every square metre of potential agricultural land is used to grow crops. In 1994, Rwanda experienced Africa’s worst genocide in modern times, with the slaughter of close to 1 million people, in 100 days. That’s one eighth of the population. Since then, the government has striven hard to bring about order from chaos and reconciliation from conflict. Our visits to the country have come from a desire to support Christians involved in helping to bring about the country’s recovery. The churches have led the way in brining about peace and reconciliation and it is a privilege to work alongside them. We have tried to show our solidarity with them by supporting various projects, in particular those which support widows and orphans. We find that they appreciate our efforts to ‘get alongside them’ and to hear their stories. You can learn more about this by visiting the ‘What we do’ section. We fully understand that the president is a controversial figure. However, we have found that, wherever we have gone, the people love him. In their eyes, he has brought about stability, economic growth and access to health care and education. He has set the country’ sights high. Cities and towns are clean. Over 4 years, we have seen an astonishing improvement in the country, most of all in Kigali, the capital. Although the country is still poor, economic growth exceeded 5% in each of the five years since 2001, driven by coffee and tea exports and expanding tourism. The economy continues to expand. We begin out visit by spending 3 days in Kigali. Then we travel south west towards Cyangugu, stopping twice on the way – first to visit some ‘Basket Fund Projects’ in Gikongoro and then the Murambi genocide Memorial site. After this, we travel through a tropical rain forest on our way to Cynagugu. Cyangugu is one of the poorest regions of Rwanda and is right on the border with the Democratic Republic of Congo. Congo (DRC) is a huge country almost the size of Western Europe. The history of DR Congo since it gained independence has been one of civil war and corruption. Congo is a vast country with immense economic resources, but remains a poorly governed country. There has hardly been a period in the last 50 years when there has not been fighting of one sort or another. This has left it in the grip of a humanitarian crisis. The ensuing anarchy has allowed warring factions to plunder its vast mineral resources. Despite the peace agreement of 2013, the area we visit in the east is still volatile. People remain in terror of marauding militias and the army. Memorials such as the one shown above can be seen along the road south from Bukavu to Baraka and are witness to some past atrocities (this one in June 2000) but many go unrecorded. As a result, western missionaries have left this part of the country. Some of the more recent trouble is linked to former Rwandans who fled there after the genocide, but these are not the only groups who engage in fighting leaving many villagers frightened. A police vehicle in Bukavu. Every picture tells a story! Many flee to large cities like Bukavu on Lake Kivu close to the border with Rwanda. UN peacekeeping forces are active throughout the region. At present Bukavu is the only entry point into Congo considered safe by our government. We have made many friends among the Christian folk there and each time we come to Cyangugu, they will come over by motorcycle taxi to see us. The strength of Christian commitment is remarkable considering the circumstances. Indigenous church communities thrive and grow. Many Congolese, mainly women, come across the border daily into Rwanda, 12 miles there and 12 miles back, to buy goods that they bring back to sell. Jo Fawcett on Good news! Judy a narfuk gal (@… on Good news!